Samuel Adams Rebel Grapefruit IPA is the newest addition to the Rebel family of IPAs, which are brewed to showcase a wide range of hop intensities and characteristics. 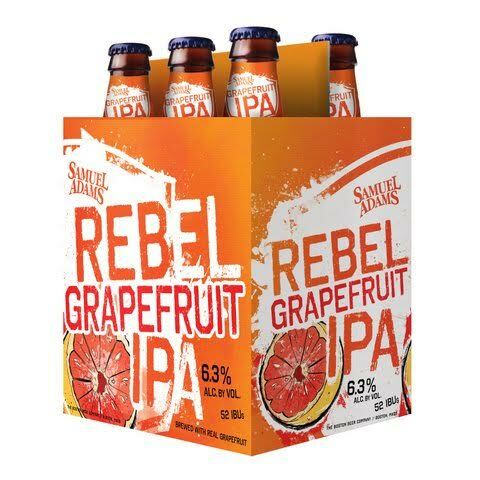 Rebel Grapefruit is brewed with real grapefruit for a big punch of citrus that amplifies the tropical fruit and citrus notes of one of the Sam Adams brewers’ favorite West Coast hops, Mosaic. 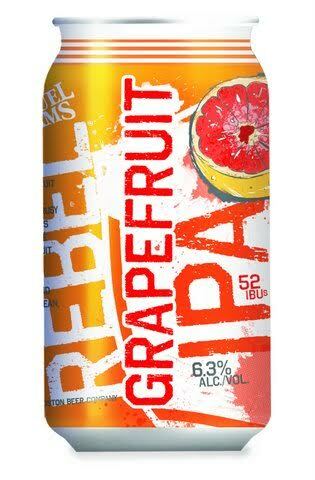 Rebel Grapefruit IPA’s grapefruit flavor and aroma comes from grapefruit juice and peel, as well as hops that showcase similar flavors. Grapefruit peel is added in the kettle to impart a tart, sharp character, while grapefruit juice is added right before the beer is filtered to provide a big, grapefruit juiciness. The juice rounds out the touch of bitterness from the peel and the four West Coast hop varieties to bring a refreshing finish to this bold, bright, thirst-quenching IPA. The combination of grapefruit juice and peel delivers a distinct bright, juicy tartness that brings out complementary notes in a variety of hops carefully selected by the brewers at Sam Adams for their flavor and aroma. The brewers focused on showcasing Mosaic hops, with their great tropical fruit, citrus and berry notes. They are relatively new to the brewing scene and when they were released in 2012 as HBC369, the Sam Adams brewers fell in love with their flavor profile and first experimented with them in Latitude 48 IPA. · Pairing with Food: The tart and refreshing character of the grapefruit is perfect for balancing soft, buttery flavors like avocado, cheese, or desserts like orange pound cake to cut through their rich creaminess without overpowering them. The bitterness and bold character stand up to richer, spicier foods like dry-rub pork or strong cheeses.